A historical science-fiction adventure that offsets its feel-good Hollywood formula with despondency over the unalterable brutality of human nature, Time After Time finds famed author H.G. 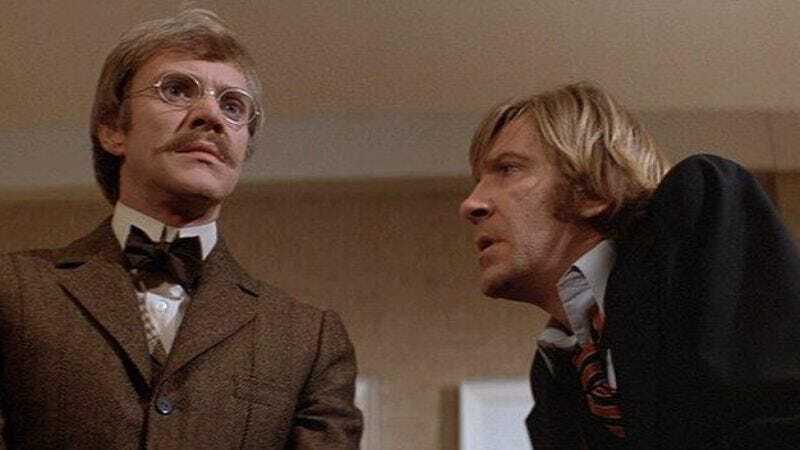 Wells (a fantastically frazzled Malcolm McDowell) squaring off against Jack The Ripper. It turns out that the notorious serial killer is Wells’ friend Stevenson (David Warner), who, to kick things off, hijacks Wells’ time machine—it wasn’t just make-believe!—and travels to 1979. Pursuing Jack to the “present day,” Wells finds himself a fish out of water. In Nicholas Meyer’s film, this results in numerous early scenes in which the inventor, decked out in 1890s clothes and spectacles, acts confused and amazed by modern marvels like McDonalds’ fast food and “motor cars.” While Wells finds it difficult acclimating to his surroundings, The Ripper is right at home in the 20th century, since as he explains to Wells during their initial 1979 face-off—set in an amusingly drab Hyatt hotel room where the TV blares nothing but bloodshed and misery—the past 90 years have reconfirmed that people still like nothing better than killing each other. That news is devastating to Wells, who previously assumed that society was destined to evolve into a socialist utopia of financial and gender equality. Nonetheless, in bank employee Amy (Mary Steenburgen), he does discover a heartening figure of feminist individualism. Wells and Amy’s romance is a clunky device designed to further Wells’ encounters with newfangled modern gadgets and concepts, as well as to provide a damsel-in-distress element to the eventual showdown. If relegating Amy to a starry-eyed woman-in-peril (and, ultimately, a figure who subjugates her own life to be with Wells) is far from progressive, it’s in keeping with Time After Time’s more despairing thread about humanity’s inability to transcend its less noble impulses. It may eventually champion love as the guiding light amidst so much homicidal darkness, but Meyer’s film—happy ending be damned—resonates most deeply when confronting the ugly, inescapable reality that man’s murderous past is likely also his future. Availability: Time After Time is available on DVD, which can be obtained through Netflix, and to rent or purchase through the major digital services.